On Thursday, March 15, Governor Wolf joined Auditor General Eugene DePasquale to announce the creation of a new School Safety Task Force that brings together government officials, statewide education organizations, law enforcement, community members, school officials, teachers, parents, and students to talk to about ways to improve school safety and security. The governor invites all Pennsylvania’s residents to submit their feedback on how to improve school safety online at https://www.governor.pa.gov/school-safety-feedback/. 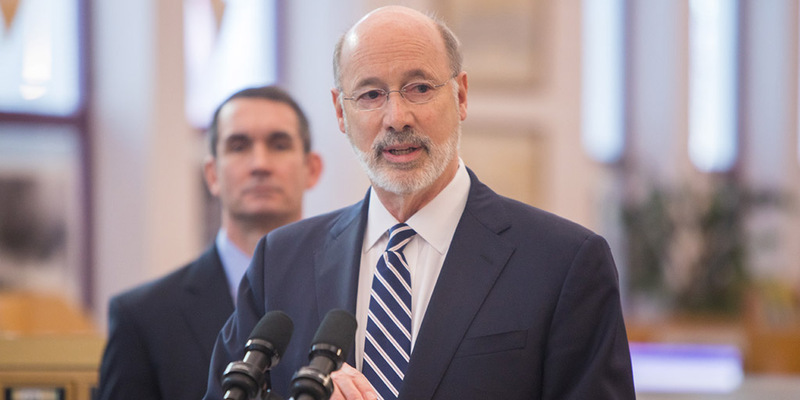 Democratic Governor Tom Wolf has announced he and Democratic Auditor General Eugene DePasquale will co-chair the School Safety Task Force. Gov. Tom Wolf joined state auditor general Eugene DePasquale in Wynnewood on Thursday to announce the creation of Pennsylvania’s first-ever school-safety task force. Wolf and DePasquale gathered at Penn Wynne Elementary School to detail plans for the task force, which comes amid calls for tougher school security (and gun laws) roughly one month after 17 people were killed in a mass shooting at a Marjory Stoneman Douglas High School in Parkland, Fla.
Wolf says the task force will focus on three areas: mental health treatment and needs, building safety, and the response by teachers and staff in the case of a violent incident. “We need to listen to teachers, we need to listen to law enforcement officials, we need to listen to parents, we need to listen to the students, and that’s what this task force is about,” said Wolf. Gov. Tom Wolf and Auditor General Eugene DePasquale announced the move during a gathering at Penn Wynne Elementary School in Montgomery County on Thursday, one week after DePasquale announced that the state would make significant changes to its safety review process at schools.